Adding a vinyl deck to a home is one way to not only increase the value of your dwelling, but also increases your enjoyment of your exterior space. Imagine, having a spot (or a larger spot) to entertain guests, grill something delicious on the barbecue, or just enjoy a quiet evening or afternoon. Before you get out the hammer and nails, however, there are a few things you need to know before building a vinyl deck or deck extension. Tuff Industries has pulled together a few considerations that can save you time, money, and a whole lot of hassle. Depending on the size of your new vinyl deck, length of extension to an existing deck, and location, you may or may not be required to secure a building permit. If you are hiring a qualified vinyl deck installer as part of your project they can likely advise on the process. Do not be tempted to save money and skip this step, as it may result in heavy fines or worse – having to tear down a completed deck that does not meet building codes or wasn’t built under permit. While wood is a popular choice for your deck’s structure, it’s not the only option. Composite, plastic, metal – there are many types of materials that can be used to build a new deck or a deck extension. Explore all of your options and weigh the costs/benefits before making a final decision. Remember, the more you put into your new vinyl deck, the more you’ll get out of it. Where do you spend the most time in your yard? What direction is the best view? What side of the home offers the most privacy? Where would you like secondary access (i.e. a staircase to a side yard)? What side of the home would a deck look best? Where does your home receive the most sun, would building your vinyl deck also necessitate the need for a shade structure as well? Do you want a roof on your vinyl deck? Of course, there is also the matter of where a deck can be easily added and tie into your existing structure for support, as well as where there is stable ground for posts. This is where a qualified contractor or deck builder can really make a difference – by providing all the options and related costs so you can make an informed decision. Almost any deck will require support, requiring posts supported by a base, likely dug into the ground. If you have a garden around the base of your home, it may affect where you want to dig (or where you want to save your plants). At the same time, you can deal with drainage issues to ensure the water coming off your deck is directed away from your home. As with above, there may be places around your home that offer a better option. The required depth of the footing for your new vinyl deck will depend on your area’s building codes. Tip Five: What about levels? In cases where a single level is too small or won’t allow for expansion, consider building a vinyl deck or expansion just above or below. You can create separate spaces – for dining or entertaining and still have room to move around. You can also think about enclosing the space under your deck to add storage, or leave it open as an addition level of outdoor leisure. With a vinyl deck covering the area below will remain fully waterproof – perfect for storage or a space out of the sun on hot days. If you’re already considering changing an aspect of your deck, it’s a great time to evaluate the condition of your deck surface and think about installing a new vinyl decking surface to protect both the old deck as well as the new addition. Doing it all at once saves time, money, and ensures that the entire structure is protected from the elements. 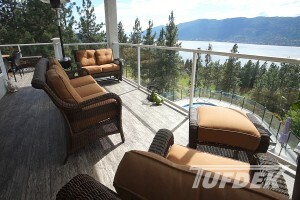 Start by checking out some amazing vinyl decks by Tufdek™, then contact a vinyl decking dealer to discuss your options.